After several days of extreme kiteboarding, it was time to take a break from the wind and discover some of the other top attractions Bonaire offers. Ready for a change of scenery, we headed to Washington Slagbaai National Park, part of our list of what to do in Bonaire. For a complete list of what to do in Bonaire, check Bonaire’s top attractions and things to do & see. 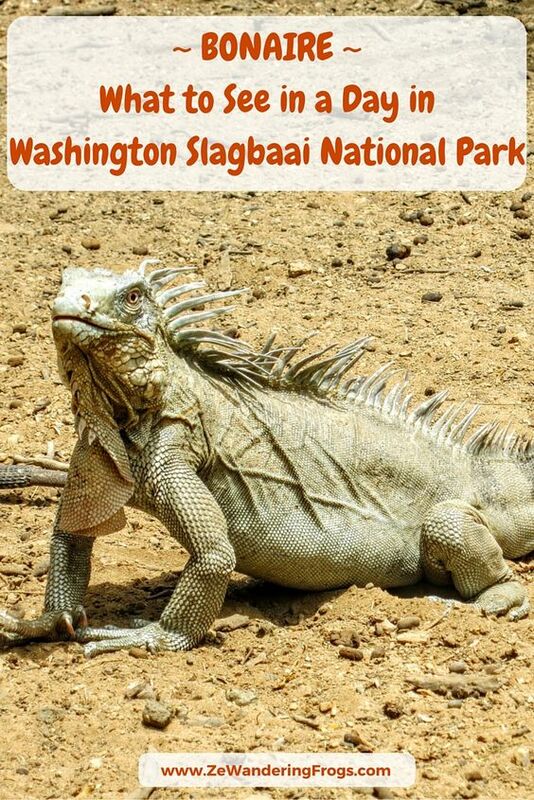 Since we had a rental car, it was easy to hit the road, and after a short 30-min drive from Kralendijk towards the north of the island, we reached Washington Slagbaai National Park. Since we had purchased the Bonaire Marine Park “Nature Fee” tag for diving and kitesurfing, we just needed to show the pass to the visitor center to gain complimentary access to Washington Slagbaai. Regular entrance costs either $25 for a year pass or only $15 with proof of the $10 Nature Fee payment. First established in 1969 as the first nature sanctuary of the Dutch Antilles, the park covers over 5,000 hectares, above 20% of Bonaire’s surface, and aims to protect the natural and historical elements within the area. Two dirt roads (4-wheel drive or high clearance cars suggested) start from the visitor center – the highly recommended longer drive of 34 km (21 miles) takes at least 3 hours, and the shorter road 24 km (15 miles) is an excellent choice to see the park’s highlights in about 1 ½ hour. We had left Kralendijk around 8 am to make the most of our time in the area, so we had time to take the longer road and discover more of the park. Before starting our drive, we wanted to take advantage of the still early morning hours and relatively “cooler” temperatures to go on a hike. The park provides three main hiking trails, the Kasinkunda Climbing Trail, the Ladagishi Walking Trail and the Brandaris Trail, the first two starting from the visitor center. The Ladagishi Walking Trail is a relatively easy walk taking about two-hour through a varied scenery of historic sites, oceanic beach, dunes, salt pans, and mangroves. The Kasinkunda takes about one hour and is a challenging hike due to its steepness and rocky trail. The trail to Brandaris, the island’s highest peak at 241 m (784 ft), requires about two hours of more challenging hike. Being the avid hikers that we are, we eagerly started towards the peak, and I was joking about the “Climbing” element of the trail name. I rapidly understood that I shouldn’t have made fun of it as it did start – to climb. Going over big rocks, boulders even, we had to concentrate on the trail to avoid falling or twisting our ankles. Besides the steep trail and large stones, the tricky aspect was to avoid grabbing or brushing the different cacti framing the path. Left and right and growing on every patch of available ground were standing various varieties of plants and thorny bushes we were keen on leaving alone. We quickly reached the top of Kasinkunda volcanic hill, providing us with sweeping views of the whole park, though we were not able to see the south end of the island as the day was overcast. On clear days, the view can extend as far as the island of Curaçao, even to Venezuela’s Santa Ana Hill or Puero Cabello mountain range if you are lucky. It was rather windy, and I could not keep my balance too well, so we descended back on the loop trail, catching sights of some iguanas, parrots and other exotic birds such as the prey bird crested cara-cara (or wara-wara in Curacao). The narrow one-way dirt road snakes through hills, dry creeks, and cacti fields. Some areas are somewhat damaged by previous rains, but most were easily manageable with a high-clearance car on a low drive. We drove past the Blow Holes and the Lighthouse, stopping quickly to admire the scenery and the crashing waves of the east shore. We made a short stop to one of the water holes in the park, the Pos Mangel, where local goats and iguanas are reputed to share the fresh water. This section was quite a bit of a drive, but once we arrived, we immediately noted the iguanas leisurely walking around, together with some of the seven types of lizards found on Bonaire, while wild goats were resting by the water. Bruno had a close encounter with one of the resident iguanas, as it thought a GoPro could be a tasty meal. Both GoPro and Iguana left the scene unarmed. Exiting the waterhole, we were lucky to spot Bonaire Green Parrots, which are indigenous of the island. The road to Pos Mangel goes by the Salina Bartol, where we found a large group of pink flamingos wading in the shallow salt pan. We walked for about 5 minutes on the caked white salt shore before reaching the flamingos. They had noticed our presence as they started to regroup slowly but we stopped to keep our distance and not distress the gracious birds. It was fantastic, just us with only these majestic animals, enjoying the silence aside from the occasional birdsong. The park hosts a large flamingo population spread across several salt lakes – watch for pink spots contrasting over white salt. Back on the main road, it was amazing to see how dramatically the water calmed down as soon as we passed the northern tip of the island driving towards the west shore. And with calmer water, we started seeing shore dive spots, with several cars and dive groups putting their diving gear on. We spotted turtles swimming by the shore, in crystal-clear water that were very attractive. We arrived by Boka Slagbaai around noon, the perfect timing for a lunch break. An old harbor featuring a historic building, Boka Slagbaai is at the meeting point between the sea and a salt pan where flamingos are usually present. A restaurant is supposedly open all year-round in the main building, serving fresh food, snacks, and sandwiches, but it was closed when we were there. I had packed a homemade salad, some fruits, and cured meat, so we picnicked by the salt pan, admiring the flamingos from afar, the pink of their slender bodies contrasting against the white salt and turquoise water. What a view we had! The area is also a popular dive site, with white sand beach and calm water. Closing back to the visitor center at the end of the drive, we took a few minutes to check some of the historical ruins dating from Bonaire’s Spanish and Dutch time. The ruins date back to the culture of aloe, a legacy from when the Washington and Slagbaai plantations were supplying aloe extract to Europe, together with salt, charcoal, goats and divi-divi pods used in leather tanning. We exited the park around 1 pm, glad we had taken the long road and were able to hike a little. We had an afternoon commitment (one of my kitesurfing lessons), so we could not stay the afternoon though I wish we could have. It was a great trip, and I would recommend visiting the park, even if only for a few hours. But a full day would allow for a more leisurely pace, taking time to swim here a and there, and chill out admiring the iguanas and flamingos even longer. As we drove back towards Kralendijk, we encountered several of the wild donkeys roaming the island freely. Though donkeys can be visited at the Donkey Sanctuary, driving is a sure way to see them in the open, sometimes even finding them grazing on roundabout downtown Kralendijk. With scuba-diving, kitesurfing, windsurfing, hiking, and wildlife, Bonaire is probably the best Caribbean island for adventure! Have more time? Find out more about Bonaire’s top attractions and things to do & see. Planning on visiting the A and B of these ABC Islands? Check these Aruba travel tips and Curaçao travel guide.